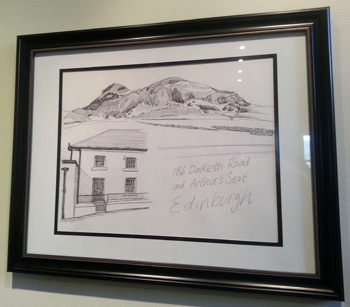 A recent commission carries memories of Edinburgh over the Atlantic. This is one of my commissions from the run up to Christmas. 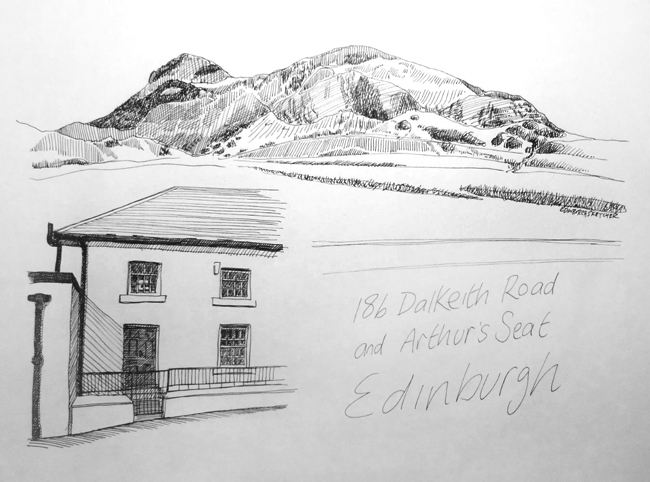 A couple who had recently moved away from Edinburgh to a new life in the States wanted a sketch of their flat, along with the stunning view of Arthurs Seat which they were lucky enough to enjoy daily. In my opinion a drawing can easily fill with emotions, in a way a photo can not. Perhaps through the lack of every detail the mind becomes connected, filling in the gaps and drawing on memories of personal experiences. really enjoy your facebook page and your sketches! Visited Scotland last June with my sister, loved it and we would loved to come back. Our mother was born in Motherwell before coming to Canada at about age eight. We have lots (over 300) pictures from our trip and enjoyed the bus tour up the Scottish coast, across and back down to Wales. If we ever get back we will contact you. Love your sketches and have wondered if you ship them to Canada. All the best!